I love homes, old ones…the one’s people design with intent and artistic panache. 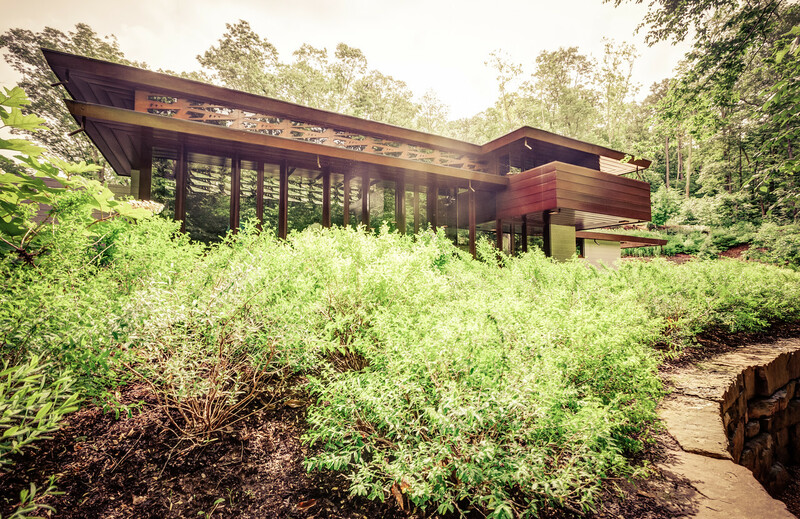 Pamela and I first learned an original Frank Lloyd Wright Usonian home was coming to Crystal Bridges on a trip to visit the museum over a year ago, it was a brilliant surprise! Wright, a native of Chicago (Oak Park is a complete Joy) didn’t often visit my part of the country. There are a few notable exceptions like Price Tower in Oklahoma (Wright’s only skyscraper), but the best work is not close…until now! There are obvious restrictions, but you can schedule (you need an appointment before hand complete with time of entry) a tour of the Bachman-Wilson House, either guided or self-guided. The symmetry and detail here are completely thought out and elegantly executed. The engineering feet to completely deconstruct a home and build it a new is also quite impressive. I say it all the time, but Crystal Bridges is a Gem of the Ozarks! Crystal Bridges is an amazing space. It’s not because they have my favorite art. It’s not because of the founders. It is honestly about what appears, at least to me, to be part of their core philosophy around art and nature. The degree to which these two are inextricably tied, how one complements…feeds the other. Both elements speak strongly to me personally. I find the best of humanity though art. I find the best of myself in nature. I think that is what I liked so much about this Chihuly show. The jaring nature of glass in the wild. These delicate creations interwoven among the trees and rocks and fallen leaves. 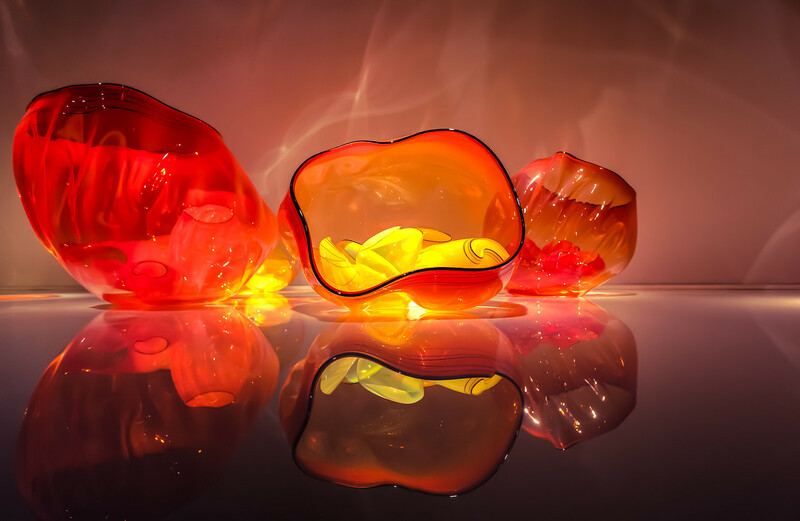 This is perhaps a more familiar form explored by Dale Chihuly and on display at the Crystal Bridges of American Art. You should go visit the display and the museum if you haven’t been in a while (of have not been at all). The have some wonderful pieces and one of the few museums in the world where you get to listen to people regularly exclaim, “Well I do that”! 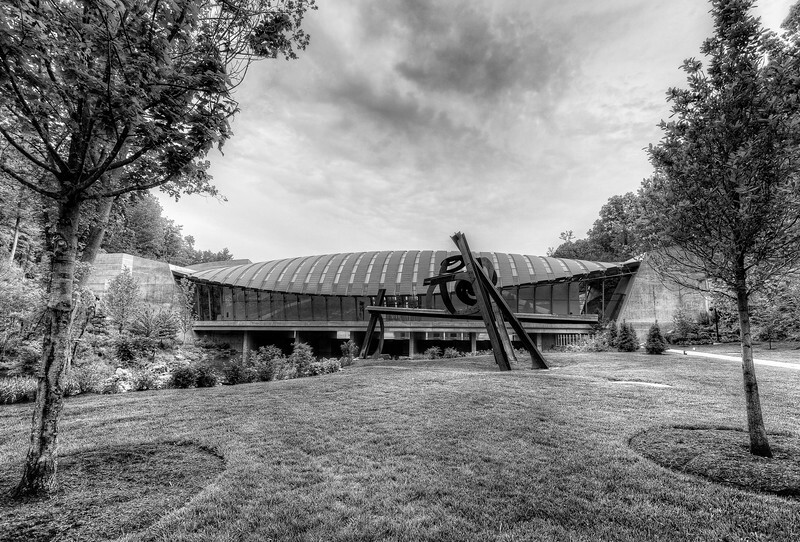 One of the great artistic resources living in the Ozarks is The Crystal Bridges Museum of American Art. It is arguably one of the finest American Art Museums in the world, and I am flabbergasted how often I run across people who don’t even know of its existence. Pamela and I recently made a trip down to Arkansas to visit the Clinton Presidential Library in Little Rock and on the way home we stopped in to see the Usonain house newly relocated to the grounds. 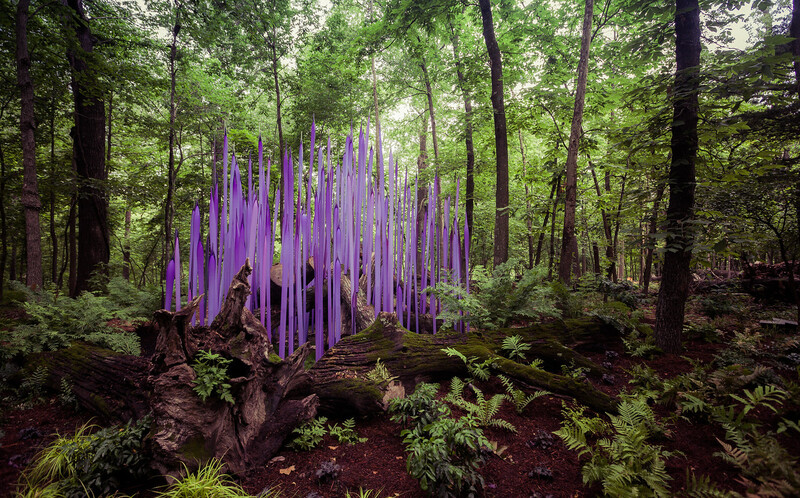 We just so happened to coordinate our visit with a fun Dale Chihuly Outdoor display (another of our favorites). This is the first of a few I will be posting over the next few weeks. It reminded me of some sort of alien form (or if you are into Magic…Emrakul). One of the fantastic parts of the Crystal Bridges Museum of American Art in Bentonville Arkansas is the hiking trails around the buildings. Perhaps the greatest treasure of Arkansas is in fact the outdoors. It is also fitting that one of the nations premiere American Art museums should devote such a grand “space” to nature itself. 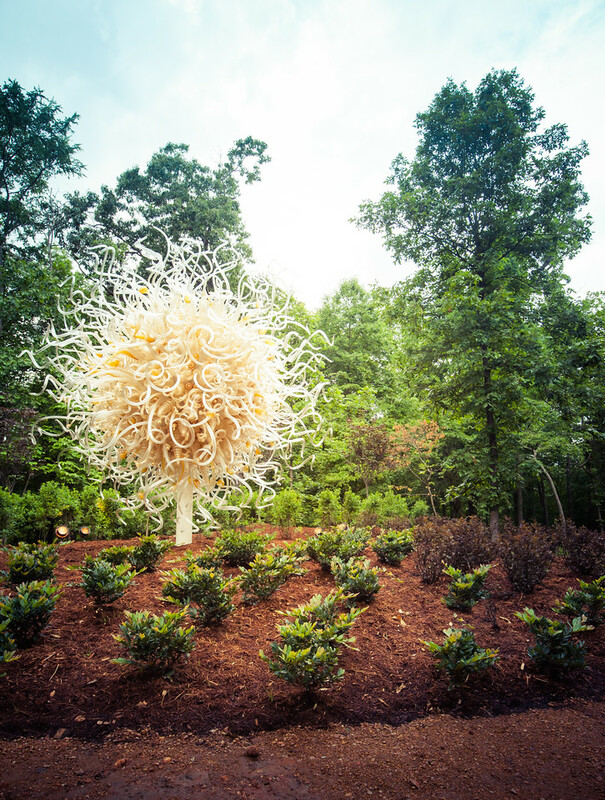 You can’t help but feel like perhaps the greatest exhibit is outside the confines of the walls of Crystal Bridges and rather out in the open air of the Natural State. One early morning Pamela and I hit the trails and took some photos. 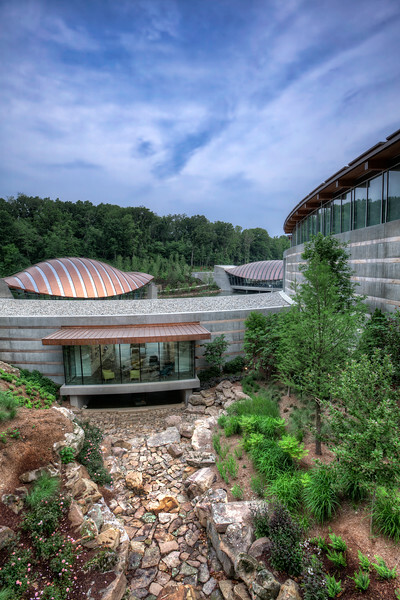 You can also see my last color shot of the Crystal Bridges Museum here. While visiting Bentonville, Arkansas and one of the cooler American History Museums in the country Crystal Bridges we went down to eat pizza at this crazy place that had a mirrored ’70’s VW bug rotating on the ceiling like a disco ball (yes full sized). On the way we spotted this church with these CRAZY big crosses. They are much taller than the church. This was a photo meant to be taken. I am much more inclined to photograph Gothic and very old Roman Catholic Cathedrals, simply because I find them beautiful. 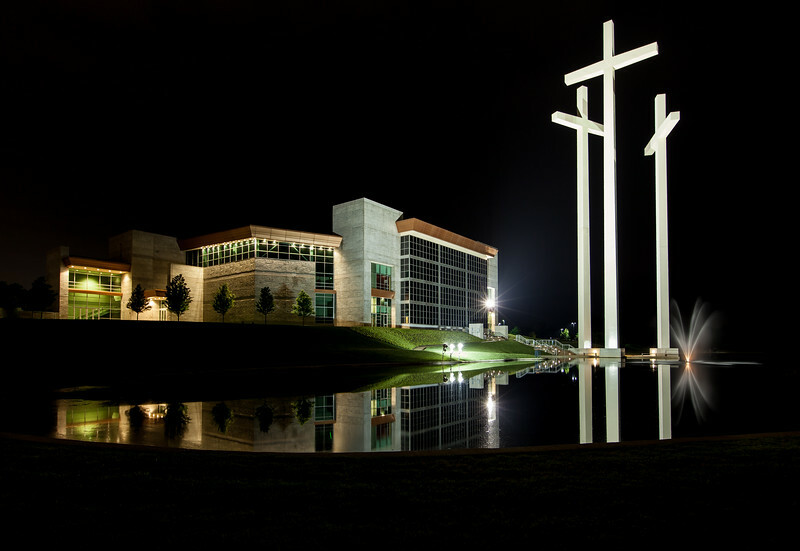 I usually pay less attention to the things we build in the states, but they too are an interesting statement about the faith of people. Enjoy. This is a one shot photo edited entirely in Lightroom 4. Sometimes people and places can surprise you. The recently opened Crystal Bridges Museum of American Art in Bentonville Arkansas is one of those. It is a sprawling complex with immaculate landscaping and some amazing architecture. We started roaming around the grounds just after dawn and spent all morning walking the trails and touring the museum. I initially had a bit of trouble convincing the security guards that I should be there. The kept trying to shoo me away. The grounds are open from sunrise to sunset, but I found with security personal this can be somewhat open to interpretation. We arrived Saturday night around 6:45 and were told the grounds were closed. Once the sun is below those trees, I close up for the night, one guard told us. I should have issued a challenge (but but but my pictures look better at sunset), but we decided to come back at dawn. This time I argued, nicely of course as these guys are just doing their job. After a short discussion we were allowed on the grounds early Sunday morning. I will probably be processing several of these shots from the exterior of the museum over the next few months. I have a good number of photos from the trip that could use some work. The new tripod has made a HUGE difference to my workflow. No more aligning brackets, everything is seamless. Further rock solid stability of my Really Right Stuff tripod means I can shoot at ISO 100 making noise less prevalent.